Capcom likes having all of Chun Li's limbs in the right places too much to put her in the ring with the Mortal Kombat fighters. If you want Blanka, Sagat, and Ryu to slug it out with Liu Kang, Sub Zero, and Shang Tsung, then you're not alone. In fact, it's a rather common request but itt's unlikely you'll ever actually see it happen; Capcom's Yoshinori Ono says that that's it's one thing for fans to ask for it, but it's quite another to actually make the game. Ono said that while plenty of people had asked about a SF/MK crossover, the two properties didn't really align that well. 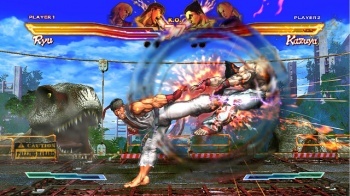 Mortal Kombat universe is known for its over-the-top gore, and by comparison Street Fighter series is positively restrained in its depiction of pugilistic violence, a point had not escaped Ono's notice. "I understand why people want it," he said. "But it's easier said than done. Having Chun Li getting her spine ripped out, or Ryu's head bouncing off the floor ... it doesn't necessarily match." The sheer level of violence in Mortal Kombat makes it a tricky pairing with a lot of other franchises. Mortal Kombat vs. DC Universe, for example, ran into problems because the DC characters don't kill people. The game's Teen rating didn't help matters either, which is why it was such a relief for many MK fans when this year's reboot turned the gore up to eleven. There are plenty of other crossovers Ono would like to see though. He said that the upcoming Street Fighter/Tekken crossover was one that he'd wanted to see for a while, and he dreamed of a DC vs. Marvel game. "[It] would be pretty damned cool if we could ever pull it off," he said. "If I can get the presidents of those two companies in the same room shaking hands, then we could get something started."